Situation: Our client asked us to redesign, prototype, and test five upgraded cards in a card-cage subsystem for their Loran (LOng RAnge Navigation – a pre-GPS terrestrial radio navigation system) transmitter. The current cards had been designed over 20 years ago. Though fully functional, they had obsolete components and needed upgrading. System architecture and proof of concept: We tested the highest risk item-the use of 3.3V CPLD Ics-to replace the integrated logic chips. 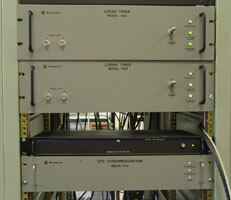 Addition of extra CPLD test circuitry: This step enabled the client to test the standard required functionality as well as the CPLD functionality. Result: Venture delivered an enhanced transmitter solution, eliminated the subsystem’s obsolete components, and reduced the subsystem’s cost.